It can sometimes be sensible to revisit oneself. Especially in this ever-changing and ever-deceiving world of ours. Just to remind ourselves, and our readers, that we are all fallible and, at times, carried away by hopes or fears. This was the case when, ten years ago, I wrote a piece on Ukraine’s first free elections after the Orange revolution which overthrew the pro-Moscow oligarchy (see “Ukraine’s inspiring boredom”, openDemocracy April 3, 2006). There was then so much hope in Ukraine, and elsewhere, that a newly peaceful and democratic world was within reach, a hope too soon betrayed by the bickering ambitions of mediocre politicians. Their movement collapsed soon enough into a new authoritarianism, followed by another “Revolution”, a new but also corrupt batch of mediocre politicians and ongoing attempts by Putin’s Russia to dismember its neighbor who was less than vigorously defended by European and American friends alike. It might be the same with the parallel I drew two years ago between the surge of Scottish and Catalan independence movements – the term ‘independence’ preferred by many Catalans who avoid using ‘nationalism’ with its, too often negative, if not polemical, connotation -, (see “Catalonia vs. Spain, a clash of two nationalisms”, openDemocracy August 14, 2014). If the future of Scotland finds itself partly tethered to the confused Brexit process – many people are watching this situation far closer than I – the fate of Catalonia and its relations with the rest of Spain have descended into much more confusion than it looked then, when optimism and passion were ferrying hundreds of thousands if not millions of enthusiastic citizens to the streets. 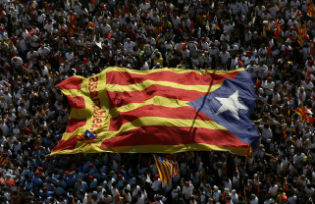 Since then Catalonia has experienced its own referendum on November 9, 2014 and “plebiscitary” elections on September 27, 2015 – both not recognised by Madrid. In the first, 81% voted for independence and 10% for a new state within Spain; but less than 50% went to the polls. In the second, the Junts pel Sí (United for Yes) coalition between the main independentist parties, leftist Republicans (ERC) and moderate Convergencia (now Democratic and European Party of Catalonia, PDECat) obtained 62 seats, six less than an absolute majority. So they need the support of the 10 MPs from the unpredictable far left CUP (Candidatura d’Unitat Popular) which tends to put social and “revolutionary” issues ahead of independence (as if you could have social justice without first having a state in which to implement it) – for instance by publicly burning pictures of the King, for which some have recently been charged by the police. The political situation in Spain is partly responsible for this stalemate as it took almost one year and two general elections to form a minority government led by the conservative Popular Party’s outgoing Prime Minister Mariano Rajoy. And this was only thanks to the support without participation in the government of the new conservative Ciudadanos, together with the internal divisions of the Socialists (PSOE), both of whom are scared of a third poll within a year. What could any dialogue be about if the crucial issue of the status of Catalonia is not on the agenda? As columnist Josep Ramoneda wrote in the Catalan edition of the daily El País (Dec. 9, 2016), this “Operation dialogue” is aimed at maintaining a grip on the political terrain after four years of political climbdown, by pretending that negotiations are moving forward. “Dialogue has a good reputation as it sounds conciliatory(…) But it needs conditions such as jointly fixing the rules without imposing one’s views and that both parties recognise and are open to each other”. Which is far from being the case now. In the government, but also in the opposition there is stalemate. The PSOE – in free fall like its British Labour counterpart – is losing seats at every election, while the leading Spanish party PP, equally unpopular and rigged by corruption, remains bitterly divided by personal rivalries as well as on the Catalan question. Some advocate a “federal” solution while others cling to the status quo. Both parties just agreed that any refurbishing of the Constitution should not touch on issues of self-determination or the monarchy. Meanwhile, having changed its head of government – Artur Mas being replaced by the more radical Carles Puigdemont – Catalonia has started her own process towards independence which, they say, should happen by September 2017. Local legislation, local government and even an embryo of tax and foreign service are gearing themselves towards that goal, which is bitterly opposed by the central government. Ministers as well as the Chair of the Catalan Parliament have been sued for participating in an “illegal” process, threatened by possible jail sentences if they go on with their “Right to decide” process. Two opposing logics are confronting each other, legalism vs. self determination or, as the independentists say, “Democracy”. The problem for them is that they have no control on the political agenda and that, despite having grown from between 10 and 20% of the population to around 50% since 2010, overcoming for good that benchmark still seems difficult, since a number of Catalans are wary of such an uncharted future. Yet this remains an unexpected achievement, mostly thanks to Rajoy’s unbending strategy of rejecting any compromise, while relying on the process to collapse as Catalans bicker among themselves. Each time Rajoy opens his mouth we gain hundreds of new votes, militants used to boast. If some independentists continue to claim that diversity is productive and that the process is going on regardless, their divisions, intra or between parties and movements, have weakened their positions. Depending on the erratic support of a CUP torn apart between radicals and moderate to vote every bill in, including the budget – the ERC and the PDECat divided by their own local ambitions – has opened up a space for the new alternative Podemos party and its local allies En Comú, led by the new mayor of Barcelona, Ada Colau. They have made large inroads among disappointed Catalan voters and even won the popular vote in the last general elections of June 2016, with 12 MPs against 9 for ERC and 8 for PDECat. Podemos’ political ambiguity, in Spain as in Catalonia, has led them to some significant success. But this could also become self-destructive as, while they advocate self determination for the Catalans – a position which displeases most voters in the rest of Spain – they also advocate that they should vote No to independence! In Spain as elsewhere in Europe and in the democratic world, too many voters are weary of traditional parties and attracted by those who appear, or want to appear “new” and unsoiled by the present quagmire. The democratic system has lost credibility, unable as it is to solve voters’ day to day problems like jobs, housing, income… And Spain’s politicians are no better than those elsewhere, with corruption creeping in at national and local level. It is the same in Catalonia where politicians are no better, no worse, no more efficient, honest or charismatic than in the rest of the Iberian peninsula. Bogged down by their divisions, they have followed the independentist trail rather than leading it and they miss the punch displayed by the SNP which is encompassing all the nationalist Scots. History has shown that the fight of even a united people for independence is often a hard and protracted struggle. They are far from united in Catalonia, giving hope to nationalist politicians in Madrid that Catalans will fall back into their traditional divisions. As a French politician of the XIX century Léon Gambetta once said, “Politics is the art of the possible”.